Tick Paralysis is here now!! Spring is here and with it comes an unwanted pest for dogs and cats – the Paralysis Tick. New ticks hatch at this time of the year and are particularly toxic to dogs and cats. Many native animals have developed a resistance to the ticks poison, including their natural host the bandicoot, but unfortunately, most dogs and cats are badly affected if a tick attaches to them. The paralysis tick injects a poison into the system which progressively paralyses the host animal. Early signs of tick paralysis include vomiting, a change of bark and faster breathing. This quickly progresses to hind and forelimb paralysis and finally death. Traditionally we have very few ticks in the Kalinga / Wooloowin and Wavell Heights areas but this year seems to be a bit different. There seem to be a lot more ticks around. It is early spring we are finding ticks on dogs on a regular basis and have had several cases of paralysis. Perhaps all the rain we had last summer has created more favourable conditions. Similarly, you don’t have to travel too far from this area for ticks to be seen – notably the Sunshine Coast, a popular weekend and holiday destination. Every spring and summer we have animals in the hospital with tick paralysis – the result of dogs picking up ticks further afield and bringing them home. Daily Searching – Ticks are usually found from the shoulders forward in areas including the head, neck, face and forelimbs. Remove the tick using a firm pull. Grip the tick at the base of the head using tweezers or tick remover. You can treat the tick with an insecticide (use a flea or tick rinse labelled for your pet) prior to removal if you’re unsure. Do not delay in removal – proceed to the vet to have the tick removed if you cannot do it yourself. Clean the site well using fresh water and possibly some correctly labelled disinfectant. Bravecto – is the newest preventative control available. It comes in the form of an oral chew. Bravecto will last 3mths against Paralysis tick. Frontline Top Spot and Spray – will also kill ticks for up to 2 weeks. Should be applied at least 2 days before entering an infested area. This is a popular and easy treatment. Tick Collars – (similar to flea collars, but with a different active ingredient) are increasing in popularity and will kill ticks for up to a 3 month. Certain tick collars have different requirements and must be used correctly to work. Please contact us on 3357 1588 to discuss which collars would be most effective and how they need to be used. Bathing – using an insecticidal rinse that kills ticks is a popular additional treatment. Pets, on average, age five to eight times faster than humans. By age two, most pets have already reached adulthood. At age four, many are entering middle age, and beginning around age seven, your pet enters his or her senior years. Annual health checks can help us diagnose, treat or even prevent problems before they become life-threatening. They’re also a great opportunity to ask us about nutrition, behaviour or any other issues. Identify your pets real age using the charts below then call us today to book a health check for your pet. Heartworm disease is a mosquito-transmitted disease that affects thousands of dogs each year. Heartworm disease in dogs is quite common in most Australian states but the further north you travel the more prevalent the disease becomes. It is usual for dogs not on preventative treatments to become infected by heartworm during their lifespan. After injection by a mosquito, adult worms eventually start to grow inside a dogs heart and lungs, causing very serious damage. Due to their large size, they become a major barrier to the free passage of blood through the heart and eventually this causes the heart to enlarge and weaken. Most dog owners do not realise their pet has a problem until the disease is well advanced. It is only in the later stages, when the disease is difficult to treat, that the animals manifest the typical signs of advanced heartworm disease, such as a deep cough, weight loss, listlessness and weakness. Other symptoms may include a lack of appetite, shortness of breath and blood in the urine. While heartworm is an extremely difficult disease to treat, it is very simple to prevent. Monthly heartworm medications are very popular and come in the form of either a tablet (chewable or regular) or a spot on preparation that is absorbed through the skin. Some monthly heartworm medications will include other active ingredients that also control worms and fleas. All monthly preparations are 100% effective providing the correct dose is given for the dogs’ weight and that it is given monthly without missing any treatments for the dog’s entire life. Remember there can be mosquitos all year round. An attractive alternative to monthly heartworm medications has been the advent of the yearly heartworm injection. This eases the burden of remembering monthly medications and is now extremely popular, safe and also 100% effective. It is best staged with your dogs annual vaccinations and can be started as early as 3 months of age although due to the rapid growth of puppies an extra injection is given at 6 months of age. Pet Dental Health – critically Important Stuff!!! For most of us, caring for our teeth and gums has been part of our daily routine for as long as we can remember. If we don’t we risk not only having bad breath but also plaque build-up and gum disease. Just like you, your pet needs dental care too. Teeth and gum problems are some of the most common conditions we see in dogs and cats with over 80% of animals over 4 years of age affected to some degree. The severity of gum disease is dependent not only on age but also on diet and breed with small dogs and cats being more commonly affected. Just as importantly it has been shown that poor dental health can increase the incidence of heart, liver, and kidney disease, and that good dental health can add up to 4 years of life to your pet. At Kalinga Park Vet Surgery we provide the highest standard of dental care available for your pet. Under general anaesthetic, your pet’s teeth and gums will be examined and the tartar removed using an ultrasonic scaler similar to what your dentist uses. All teeth are individually assessed for health and longevity and finally polished to have them looking their sparkling best. After your pet’s procedure will discuss a preventative home dental care program for your pet. We stock a number of convenient prescription diets aimed at preventing tartar re-occurrence as well as other dental care products such as toothpaste, toothbrushes, specialised chew treats and mouth sprays. So if you would like to say goodbye to bad breath for your pet and have their teeth bright and white again call the clinic for a dental check-up for your pet. Thousands of pets are destroyed each year simply because they lack identification. This is why we recommend microchipping as part of our preventative healthcare campaign for all pets… and word is spreading fast. Under Queensland laws microchipping is compulsory. Puppies are required to be microchipped prior to sale, however, pets can be microchipped at any age. A Microchip is a tiny identity chip about the size of a grain of rice. A 15 digit unique number is encoded on the microchips. It is injected under the skin of your pet and stays there for life as a permanent form of identification. Good quality microchips are constructed with medical grade glass usually with an anti-migration coating. The microchip can be read by passing a scanner over the skin and once it is placed cannot be lost, removed or altered for the life of your pet. It is also possible to implant chips that have other functions such as measuring your pet’s body temperature. As we get smaller technology the range of functions available will increase! If you have your pet implanted you should ensure the chip comes from a quality manufacturer, not a cheap import. The staff will microchip your pet and register it on a national database called the Global Micro Database. Staff at the RSPCA and pounds will scan all lost pets. When we find an existing chip we cross-check it on the database ensuring a quick call and a happy reunion. 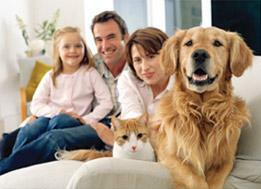 Caring for the family pet involves a lot more than just fresh food and water each day. Remember the adage“Prevention is better than cure?” ….. well, that especially applies to animals in the form of vaccinations. Vaccinations protect our pets against a number of incurable and often fatal diseases such as Parvovirus and Distemper in dogs and Feline Enteritis and Cat Flu in cats. These viral diseases don’t respond well to medications and treatment is difficult, expensive and often unsuccessful.